Happy Socktober! Raise Socks and Awareness this October. 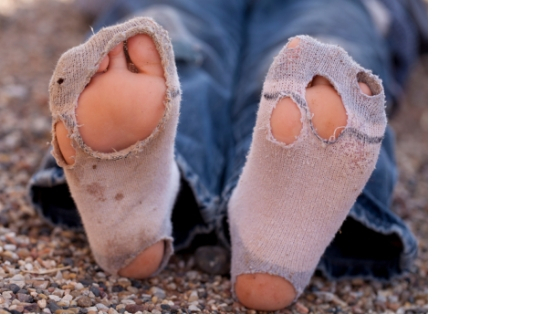 Did you know that the #1 most-needed but least-donated item for homeless shelters is socks? This fact is not highly publicized so many are missing the message that there is a real need for donations of new socks for the homeless. Socktober aims to help alleviate these problems by raising both socks and awareness during the month of October. YouGiveGoods makes it easy to raise brand-new socks for your local homeless shelter and in honor of Socktober we are offering 10% off socks purchased for donation! Every night In the United States roughly 600,000 men, women and children experience homelessness. Thankfully, Americans are charitable and many donate clothing but few think to donate new socks. We know the food bank needs food and the diaper bank needs diapers but the great need for new socks at homeless shelters and support organizations is not widely publicized. Why the great need for socks? Living on the street is punishing on the feet so socks get worn and filthy. Wearing dirty socks is a health issue especially for people with diabetes and foot wounds. And, warm socks are a necessity during the cold winter. Finally, having clean, dry socks is a true comfort to our homeless neighbors who face daily struggles and despair. The gift of new socks is a sign that people empathize with their plight and actually care. Four years ago, Brad Montegue, the creator of Kid President, launched Socktober as a month-long event to raise socks and awareness. You can be a part of the movement by sharing the facts above or stories from your local shelter at your workplace, in schools, at the dinner table and in social media using the hashtag #socktober. During Socktober consider raising new socks by holding a collection drive in your office or school. Or you can run your event online at YouGiveGoods. YouGiveGoods simplifies the process by handling all the logistics for you and enabling you to reach a wider audience of donors. 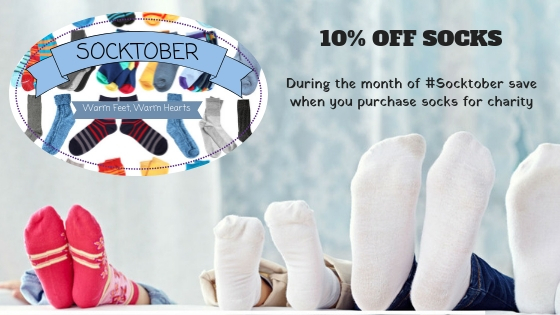 Plus, during the month of October you will receive 10% off your purchase of socks for donation on the site! Start your sock drive today. Finally, you can donate socks to your local shelter or charity. Even one pair of socks will bring comfort and relief to a neighbor in need. Or, donate socks online today to aid the homeless in Rochester, NY or Oklahoma. We’re hoping Socktober is bigger and better than ever this year. Let’s show our struggling neighbors that we care with the gift of new, cozy socks this Socktober! Sharing tales from the other side.